As a result of the severe weather warning issued for Sydney this Friday, The Wilderness Society is sorry to have to announce that the Festival for the Kimberley at Martin Place will be postponed until 8 March 2013. While this is unfortunate, the risk to the success of the event, the health and safety of performers, volunteers, animals and attendees, and the risk to equipment, means that postponing the event was the right decision to make. 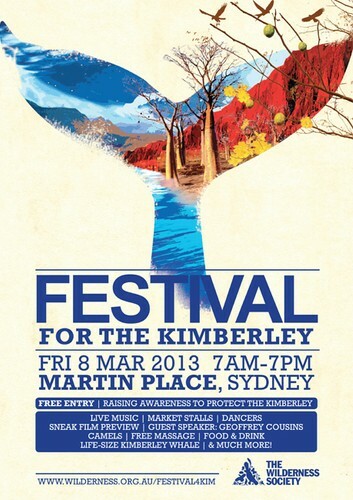 Save the new date: On Friday 8 March 2013 from 7 am to 7 pm the Kimberley is coming to the heart of Sydney! Have you ever wanted to visit the stunning wild and remote country, visit the bustling Broome markets, eat fresh mangoes or walk along Cable Beach at sunset? Come and celebrate the stunning beauty of the Kimberley region and stand in solidarity with the people of Broome against the proposed industrialisation of the area as a result of the gas hub at James Price Point – a development that disrespects Australian’s love for the region. Join the festivities and enjoy live music, dancers, speakers, camels, our life-size puppet of a Kimberley whale, market stalls, a sneak film preview, organic food, mango smoothies, beer and wine from Western Australia and much more. Bring your friends and family and be part of a wonderful Kimberley atmosphere in Sydney’s CBD!